In Creating Freedom, Raoul Martinez brings together a torrent of mind-expanding ideas, facts and arguments to dismantle sacred myths central to our society. In this Preface Martinez examines the language of freedom used today which ‘frames the most urgent issues of our time and the deepest questions about who we are and who we wish to be’, to ultimately propose that we must ‘reclaim’ freedom in order to transcend control over profit and power. Free markets, free trade, free elections, free media, free thought, free speech, free will. The language of freedom pervades our lives, framing the most urgent issues of our time and the deepest questions about who we are and who we wish to be. Freedom is a stirring ideal, central to the concept of human dignity and visions of a fulfilling and meaningful life. Its universal appeal, its ability to unite and inspire, have long made it a powerful political weapon. For some it is a clarion call for revolution, for others a justification of the status quo. Academics, think tanks, religions, political parties and activists have recast the concept in different ways. In the scramble to define it, the ideal of freedom has been pushed, pulled, twisted and torn; expertly moulded to suit the interests of those with the power to shape it. Even as they steer our economies, democracies and judiciaries, today’s dominant conceptions of freedom are unknown to most people. They are part of the conceptual foundation upon which society has been built, framing our thinking on everything from punishment and reward to capitalism and democracy. But this foundation, mixed as it is with myth and illusion, is crumbling. Plagued by civilisational crises – eco­nomic, political and environmental – the towering edifice it supports is not only unstable and unsustainable, but unjust. For too long the lan­guage of freedom has been used as a tool of control, helping to justify poverty, erode democracy and lend legitimacy to barbaric punishment. As inequality soars, economic crises erupt, people work longer for less, as refugees surge across borders, corporate power intensifies, forests disappear and sea levels rise, it is time to engage in a fundamental reassess­ment of this hallowed ideal. When a society fails on multiple fronts, its foundational ideas must be questioned. A simple principle animates these pages: the more we understand the limits on our freedom, the better placed we are to transcend them. We may well be less free than we like to think, but only through under­standing the freedom we lack can we enhance the freedom we possess. Ignorance of our limitations leaves us vulnerable to those able to exploit them. Facing up to the limits on our freedom explodes a number of persistent myths – myths surrounding individual responsibility, justice, political democracy and the market. Some of these myths persist because they advance the interests of those in power; others because they flatter us, offering false comfort. All come at a price. The way we think about freedom shapes our view of the present and our vision of the future. It is a lens through which we interpret and evaluate the world, a compass by which we set our course. But not all conceptions of freedom are created equal. Each is based on assumptions about the world, some of which fly in the face of evidence and logic. A sharp distinction is often drawn between questions of free will and those of political and economic freedom. Traditionally, these concepts have been separated into distinct categories, but this obscures more than it reveals. We dissect reality into manageable parts for study, but, if we do not put those parts back together in order to gain an understand­ing of the whole, we risk losing sight of the big picture. We risk losing touch with reality. This danger is inherent in modern education where the price of progression through the system is specialisation. Too often, where we should discover connections, we are taught to see impassable subject boundaries, but the limitations on our freedom are intercon­nected. A thorough understanding in one area enriches and changes our perception in others. To delve deeply into the meaning of freedom we have to breach disciplinary boundaries along the way. Insights and evi­dence from philosophers, psychologists, economists, historians, scientists, criminologists and environmentalists all play a role in the discussion to come. By building connections and teasing out their far-reaching im­plications, a radical, cohesive framework emerges – one that provides a much-needed overview of where we are and where we could be. On the one hand, parts of society remain passive and deeply cyni­cal about the possibility of change; on the other, social movements are rapidly growing around the world in response to the interlocking crises facing us. More and more people are questioning the systems that domi­nate their lives and diminish their liberty. Against this backdrop, it is time to reclaim the ideal of freedom for the urgent task of putting people and planet before profit and power. We need a movement born of a shift in consciousness, one that will challenge the assumptions upon which our society is founded. To value truth – that elusive but all-important ideal – is to try and follow it beyond the shell that encloses our present understanding: to break through the defining labels of our inherited identity, the disciplinary boundaries that characterise our education and the limits set by society on our imagination. This book challenges ingrained assumptions about ourselves and the world and calls for an urgent transformation in our thinking and behaviour. It is a manifesto for deep and radical change. Through the prism of freedom, it examines the limitations of our dominant ideas and the failings of our current system, but it also explores the great potential that exists to create something better. The ideas and means to do this already exist, but we need to share them with each other, connect with each other and act on them. We need a revolution in our thinking that will spark a revolution in the way we organise our lives and structure our societies. A better world is possible, but if we take our freedom for granted we extinguish the possibility of attaining it. 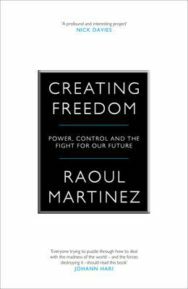 Creating Freedom by Raoul Martinez is out now published by Canongate Books priced £20.00.